Deira Island is a group of artificial islands in Dubai, United Arab Emirates. The project was initially planned to be part of the Palm Islands and was called Palm Deira. By early October 2007, 20% of the initial palm island's reclamation was complete, with a total of 200 million cubic metres (7 billion cubic feet) of sand already used. Then in early April 2008, Nakheel announced that more than a quarter of the total area of the Palm Deira had been reclaimed. Since 2008 the project was on-hold. The World, another artificial island project in Dubai. ^ David Ingham. 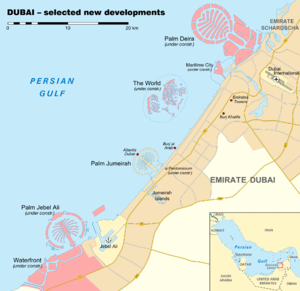 "Nakheel's unfinished projects". constructionweekonline.com. ^ "Falling construction costs favour developers". MEED. This page was last edited on 25 June 2018, at 20:26 (UTC).